Takata Corporation, the Japanese maker of air bags used by auto manufacturers, is accused of selling faulty airbags to at least 11 different automakers dating back as far as 2001. 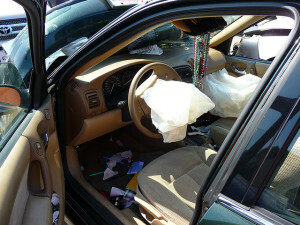 The problem with these airbags is that they can rupture and spray shards of metal at drivers and front-seat passengers. The first reported airbag shrapnel ejection occurred in 2004, however, Takata apparently tried to conceal the incident and did not issue a recall until 2008. Further scrutiny by experts shows that in high-humidity environments, like the Tampa Bay area and the rest of Florida, moisture can seep inside the airbag inflator and destabilize the chemical explosive. This can lead to an airbag explosion even after a minor accident. Numerous people have been injured, blinded or killed after these airbags sent metal and plastic shards flying through a vehicle. Just last month the government added 4.74 million U.S.-market vehicles sold by Toyota, Honda, Mazda, BMW, Nissan and General Motors to the recall list for housing faulty Takata airbags. This is a serious safety concern, which is why the owners of vehicles that contain Takata airbags are urged to have the vehicle repaired as soon as possible. More than 14 million vehicles from 11 automakers have been recalled for the defect to date, with most of these recalls occurring in the last two years. Takata’s faulty airbags have been linked to at least four deaths and more than 100 injuries, dating back to 2004. The Tampa Bay Injury Lawyers at Whittel & Melton are currently investigating Takata airbag lawsuits. We are offering free legal consultations to all injured parties, as well as the families of victims who may have been harmed by these defective bags manufactured by Takata. To learn more about your legal options and rights, please call us today at 813-221-3200 or 727-823-0000. You can reach us anytime statewide and toll-free at 866-608-5529 or through our online contact form.